Kevin Pollak is one of those famous people well-known for different reasons by a lot of different groups of people. He's been a standup comedian for more than 30 years, and one of comedy's most skilled impressionists. As an actor, he's been in a long list of memorable movies, including "A Few Good Men," "Casino," "The Usual Suspects," "The Aristocrats," and "She's All That." More recently, he's been working a lot as a prestige TV actor, playing the main character's father-in-law on "The Marvelous Mrs, Maisel," and also landing memorable guest spots on "Better Things" and "Billions." 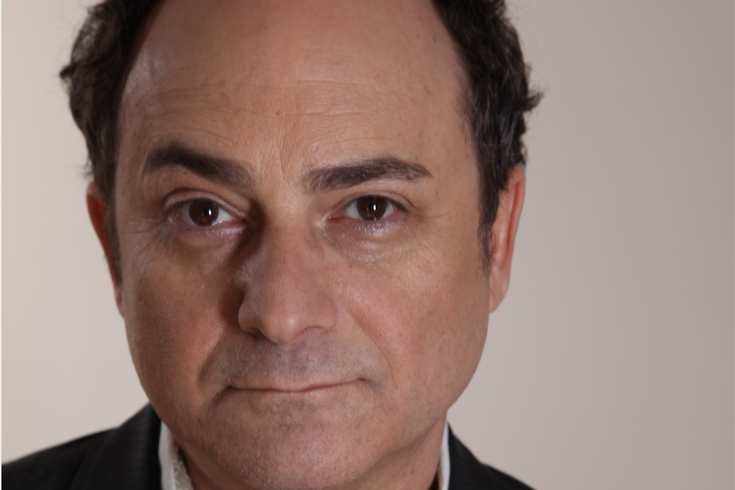 Pollak recently finished a ten-year run hosting Kevin Pollak's Chat Show, an Internet video show and podcast on which he interviewed actors and comedians, sometimes for as long as three hours at a time. He's also well-known in the poker world, as an avid player who hosts celebrity games and once competed in the World Series of Poker. On a weekend break from filming the third season of 'Mrs. Maisel' in New York, Pollak heads to Philly this Saturday, for a stand-up show at Congregation Keneseth Israel in Elkins Park (tickets are available here.) PhillyVoice spoke to Pollak last week about his career, his comedy, and how "Mrs. Maisel" has caught on with demographics he never thought possible. "My standup has always been that of a storyteller, more than a joke teller. Damn funny stories, mind you. But, definitely autobiographical, or semi-autobiographical," Pollak said, when asked what he'll be talking about on stage Saturday night. "I tend to come with a 'leave your troubles at the door' kind of act," he added. "It's always been my intent to be a bit of an escape act, instead of talking about the woes of the world. It's more like, let's go on a journey, and let's talk about what happened when I met Christopher Walken." Pollak also said he will indeed be doing impressions - "I'll be teaching the audience how to do Jason Statham." On "The Marvelous Mrs. Maisel," Pollak plays Moishe Maisel, the father of Joel, the protagonist's ex-husband. He says that while he knew the show would catch on, he had no idea it would have the reach it has. "I've been gainfully employed for 30 years as an actor, comedian, and a writer, and recently a director," he said. "And over the years, I've had a few seminal films. Like, 'The Usual Suspects' premiering at the Cannes Film Festival and us being treated like The Beatles when we arrived. 'A Few Good Men' having its premiere at the Ziegfield in New York. 'Casino,' just an absurd experience and a film that just becomes more legendary with every generation. "So, I've had that rarefied air experience over the years- studying at the feet of Matthau and Lemmon in the two "Grumpy Old Men" movies. I've been already ridiculously blessed here. But nothing that broke through the noise [like Mrs. Maisel." He added that the show recently had a European premiere and press tour, and the show is even popular in places like Indonesia. "When we all read the script and were shooting the thing, we thought, 'we'll certainly have a lot of fans [among] Upper West Side Jews, of New York- older ones, in that, who remember the late '50s. We didn't know that 20-year-olds who have never seen a Jew... I don't know that I've been a part of something that crosses every single demographic." The "Marvelous Mrs. Maisel" isn't the only current hit show that Pollak is a part of. Last week, he kicked off a guest stint on the Showtime drama series "Billions" as Douglas Mason, the father of Taylor Mason (Asia Kate Dillon), the show's gender non-conforming financial genius. Pollak said the part came about when he attended an event at MoMA in New York, following a special screening of last year's "Mission:Impossible" film, which was directed by Pollak's friend and "The Usual Suspects" screenwriter Christopher McQuarrie. At an after-party, which was attended by the likes of Bill and Hillary Clinton, Pollak met "Billions" co-creators Brian Koppelman and David Levien, who pitched him on the guest-starring role. Pollak eventually signed up, even though it required special arrangements with Amazon to allow him to appear in more than three episodes of a non-'Mrs. Maisel' show. The busy acting career of late has helped bring about the end of "Kevin Pollak's Chat Show," the talk show that he hosted that ran nearly 400 episodes over 10 years. Pollak got into the show, he said, at a time when there were fewer than 50 entertainment podcasts. "I had done every form of talk show. A couple dozen Tonight Shows with Carson, and Letterman, and Conan, and one of the more enjoyable ones was Charlie Rose, before he got all handsy. Because it was a conversation with a journalist, someone who had done their research." The original pitch, he said, was "A Charlie Rose Show, but fun." The show's guest list over the years has included a virtual who's-who of important actors and comedians from the past two decades. Tom Hanks was on the show, as was Larry David, and even Elon Musk. Pollak said he's asked every day about some episode or moment from the show. But once he got too busy, was missing lots of episodes, and noticed it was getting to the point where "in Los Angeles, being asked to be on a friend's podcast became like a jury duty notification," the decision was made to wrap the show up. Another past role with which Pollak is often associated is "She's All That," the 1999 teen movie that recently marked its 20th anniversary. The actor, who played Rachael Leigh Cook's "Jeopardy"-loving dad, said he signed up for the movie in part because he was impressed with Freddie Prinze, Jr., in an indie film a couple of years earlier and was eager to work with him. "There are a lot of great performers in that damn thing," he said. "I thought it would speak to its own generation that it was earmarked for, but I didn't know we'd be celebrating it  years later." As for the state of comedy itself, Pollak is bullish. "I think it's celebrating a boom bigger than the one that I worked through in the mid-to-late '80s," he said. "What I'm seeing is, a lot more comedians are touring the world, a lot more comedians are playing theaters instead of just clubs. And yet the small indie theater/club scene is thriving, with alternative acts as well. And some of the alternative acts are blowing up on a world scale as well. So I can't imagine a time that was bigger and more exciting for stand-up than right now." Pollak was told that he can probably expect a warmer reception when he takes the stage at the synagogue this weekend. "I would become equally as famous if I turned on a roomful of Jews and yelled at them," the Jewish comedian said, though he acknowledged that might not earn him the kind of fans he wants. While he doesn't do as much standup these days as he once did, Pollak said he keeps his toe in it. "It's in you for life, there's no getting out. Harder than 'The Firm.'"